The white are just glorious, very clean and bright looking!I bet they really stand out when the light level starts to fade! Very nice indeedy, looks good with that bit of blue grape hyacinth but have to confess it would be pulled out if it was in my garden, they grow like weeds. The blue is lovely but oh those leaves that grow so prolifically. 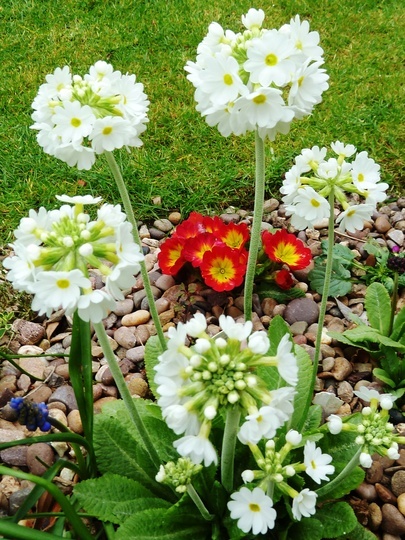 The white primula is gorgeous looks especially good with the small stones around. Love those whites, especially, Tt!!! Very patriotic TT. Getting ready for THE wedding then? That's beautiful Tt, the white primulas are so pretty.....talk about 'OMO WHITE' ..... as they used to say on the advert!!! I have the lilac one but is not in flower yet, it flowers slightly later. I must look out for this white one. The Primulas are lovely TT. Very pretty TT, and as already said very patriotic. Thats funny,Terra,so do I.The others are almost non existent, with one tiny flower on both the lilac,and Magenta ones,and have been in two years..all in the same border too.I wonder why ? ...maybe it depends on soil type ? There was a time when all my springtime flowers seemed to be purple...LOL. Good luck with your colour schemes, Cristina ! The white flowers are drumstick primulas ..
primula denticulata .... they last a long while ..